After our first night in Amsterdam and partying our butts off, we buckled down and hit the town for some sightseeing. 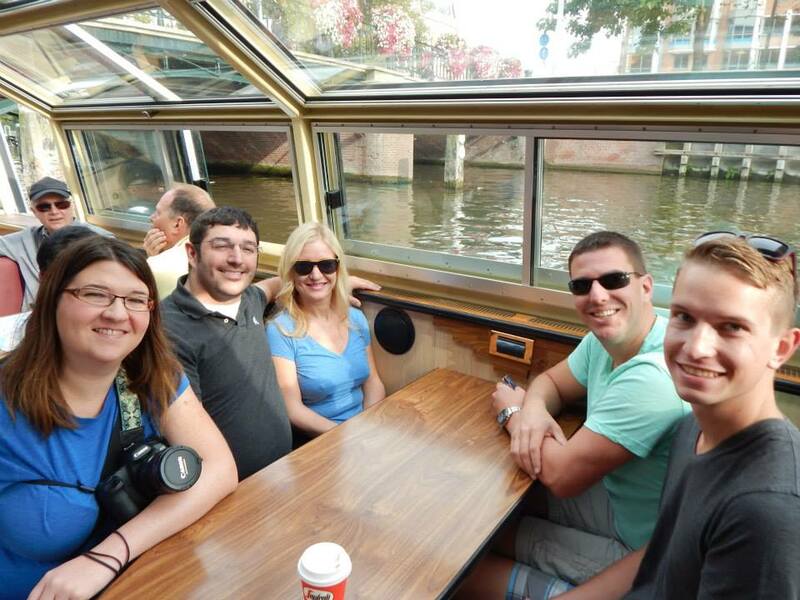 We had a “hop on, hop off” tour with a boat that went through the canals scheduled for the day so we walked a few short blocks until we got to the canal. The boat was large and green, with seats for about 25. We found our place and got on and off a few times, seeing the Van Gough Museum, the beautiful streets and alleys, and stopping for lunch and drinks on a nearby street. Back on board the boat, we were chatting away the minutes when all of the sudden the captain of the boat screamed, “Whoa, whoa, whoa!” The engine shuttered and we could feel it trying to go in reverse. But the inertia of the boat was too much for it to stop. Just as I was climbing up on the back of my seat to see what was going on, a sudden force threw me back into my seat. And the sounds of two boats colliding followed by short-lived screams of passengers on the two boats filled the canal way. The driver quickly grabbed the small, black radio from the dashboard and mumbled something in Dutch very quickly into it. A few minutes later, both captains were backing away from each other and waving kindly as we took a sharp left hand turn away from the “crash” scene and towards our next stop. The final stop was a bit difficult for me to get out of the boat. There were about five steps, actually more like small holes, in the side of a very old, brick wall. The boat pulled up and we knew right away that this would involve Matt helping me up. I crawled onto his back while Julie took the wheelchair. Mike went ahead and helped Julie lift the wheelchair above the boat to the flat land, about six feet above our heads. Next he pulled Julie up and as Matt started the journey, Mike pulled his hand each “step” of the way. We made it to the top knowing all too well that we would have to get back on the boat to get home. But, as we know, going down is always easier…and that was the case here too. A few blocks away was the Anne Frank house. I was most excited to see this, of all things, in Amsterdam. 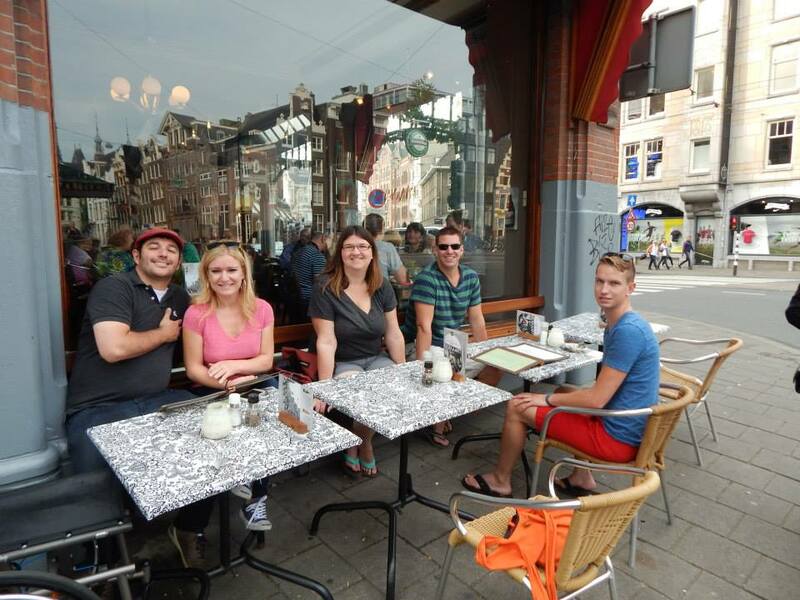 Some of our group had already visited the Anne Frank house on previous trips, so we split into two groups. We approached the long, winding line that took up about the space equivalent to a basketball court when a staff member approached us. He instructed us to follow him. We figured this was typical protocol, as most places I visit I am able to cut in line to get to the accessible entrance. However, the rules were different here. We were told that I was not able to go inside the house because of my wheelchair. We explained that we knew there were a lot of stairs, very steep stairs, and even a ladder, and that we were prepared for that. We explained that I was perfectly capable of going on Matt’s back for these portions. But they didn’t seem to care. They told me that I could wait in the gift shop while the others in my group did the tour, and that they would at least let the others cut in line so I didn’t have to wait as long. We were appalled. It was absolutely ludicrous! I had traveled halfway around the world to see something that would have been so easy for me to see, and I was being told no. As I was getting ready to walk away, a manager had come to see me. He explained that he was sorry. But it didn’t matter anymore. They wouldn’t let me past the glass doors into the museum. I told the others to go on and enjoy it, and to take pictures for me. I pointed off in the distance at a café that had tables outside. We agreed to just meet there when they were finished. As I propelled myself over the stone bridge towards the café, I couldn’t help but think of the irony in all of it. Anne Frank was trapped upstairs behind a bookcase for something that was out of her control. I was trapped downstairs behind glass doors for something that was out of my control. It made me wonder if the world really was changing, or if we were just changing the way that we control each other. Either way, though, I knew I had the advantage and had to believe that someday the stairs wouldn’t stop others from hearing her story. I couldn’t help but think that the hope in all of us is what drives the good in people forward. I sat down at a table and ordered a beer from the frazzled and sleepy gentleman who poured out of the restaurant a few minutes after I sat down. It was a peaceful day, with bikers cruising on the cobblestone streets and the sun shiny just perfectly on my cheeks. And while I couldn’t experience the Anne Frank house, I did get to experience a few minutes of solitude on the side of the street in Amsterdam. It’s a moment I will never forget. A very bittersweet moment. I was startled out of my deep thoughts suddenly. “Renee! What are you doing here?” I heard Mike and Erica holler across the street. We had agreed to meet up with them, but it was too early for us to be done. So of course they were surprised to see me…and to see me alone. They quickly ordered a few drinks and I explained what happened at the Anne Frank house. Just as I was finishing up my story, I looked down at the table and saw that Erica was carrying a small, white, plastic bag. She didn’t have this when we parted ways 30 minutes ago, so I quickly asked, “Wait, what did you guys do up until now?” eyeing the bag suspiciously. 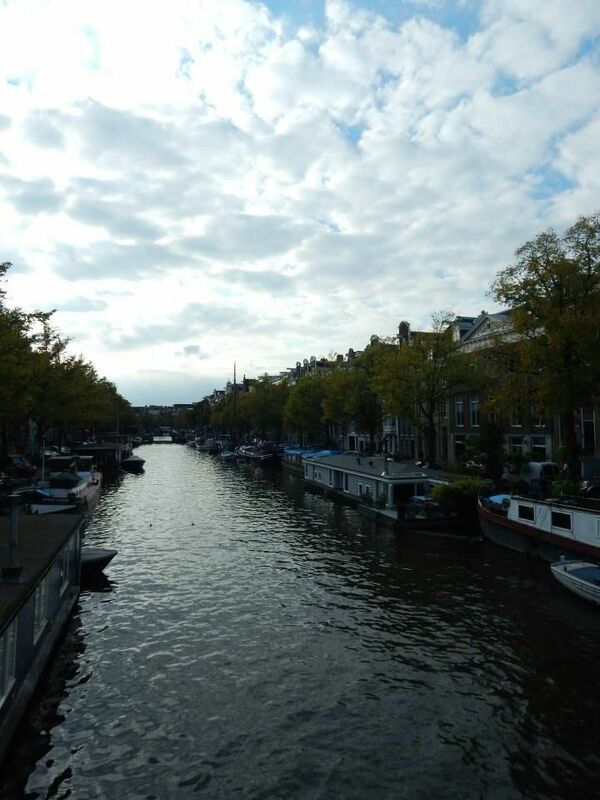 They looked at each other and quickly said, “We can’t tell you…” I was afraid to interrogate any further, knowing we were in Amsterdam and they could have any variety of “trouble” hidden in the bag. I had a look of pure curiosity on my face when I saw the rest of the group heading towards us. “Over here guys! Over here!” And a few minutes later we were all together again. But what was in the bag?? Glad you got to see everything important in Amsterdam. I do envy you a little since I am working and have very little vacation.